The NWSRS ratings system has been updated through events of Memorial Day weekend, and this means that the OSCF State Championship from earlier in May has now been rated; to see the ratings report for OSCF State, click here. Along with the USCF section rating report (completed earlier this month — click here), we’re now up to date on our tournaments. This means that we now have the information necessary to generate the Spring All-Stars lists, which are coming soon. Keep an eye out here — the lists will be posted on this page once complete. Have a great final few weeks of school! 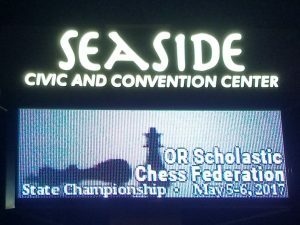 Thanks to everyone who attended the 12th Annual OSCF State Chess Ch ampionship last weekend, and a particular thanks to all the volunteers — parents and coaches of players, as well as last year’s OSCF Board, who helped make the event a great success. In the end, we had 352 players participate in the main event, including 150 Elementary players (grades 3-5) — our largest number of Elementary players ever, and 20 players shy of our all-time attendance record. On Friday evening, we had 151 players in the blitz tournament, and 220 players (55 teams) playing bughouse. We had 23 players in our Friends and Family tournament. 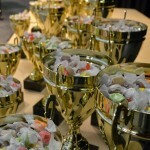 Because the ratings official for the Northwest Scholastic Ratings System is out of the country for the next couple weeks, you won’t see the NWSRS Tournament report for State posted until late May (though the USCF ratings report is complete and posted here). We will also, therefore, wait until late May to produce the Spring 2017 Oregon All-Stars List (which will cover games played from January 1 through May 6, 2017). In the meantime, though, linked below is information for each of the sections at State. Please note that while these sheets include a “Rating” field (with the player rating from before state) and a “Post” field (which includes an estimate of the player’s rating after the tournament), that “Post” rating is an ESTIMATE only, and is not official. It’s generated within the program that we use for pairing, and while it can be close, it is also often off by many points. But it’s something to look at until the official reports come in. If you have questions about the tiebreak process, please read the information at this link first; it should answer many of your questions. Those of you looking to go deep into the results can click here for the above PDF document in Excel format.